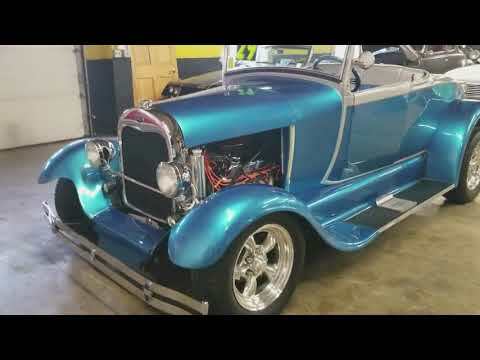 Check out this sharp 1929 Ford Roadster! This Hot Rod was just brought to us by a good customer of our who is ready to sell it and get something new for his collection. Powered by a Ford 351 paired with an automatic transmission and Ford 9 inch rear this car will haul the mail. It's kept cool with an alluminum radiator and electric fan that can be actuated at the driver's discretion with the simple flip of a toggle switch. There's a nice looking dashing containing a gauge cluster that has that "era correct" look and does function. This is a glass bodied car that was updated with fresh paint and a new interior within the last 2 years. It's riding on American racing polished wheels and 4 matching Uniroyal tiger paw radials that have less than 1000 miles on them. This roadster also has rack and pinion steering with new tie rods, new front disc brakes have also been installed with drums in the rear. The 351 idles smoothly and does not have a big cam or much lobe, just what you would want for cruising and still have a great sound. Speaking of sound there has been a stereo custom installed under the dash you may not be able to see in the pictures. If you're looking for a car to show or just take out and have some fun on weekends this one will defintiely fit the bill. Feel free to call us at 507-386-1726 with any questions you may have. You can also email us at "sales@uniquemankato.com" ALL TRADES AND REASONABLE OFFERS WILL BE CONSIDERED.....FINANCING IS AVAILABLE!